I thought I would be super happy now that we have broadband at the end of the Gunflint Trail but it turns out I’m not thrilled. Don’t get me wrong, I love faster internet and the fact we can actually connect to the internet to get our work done. When the internet was slow it was super painful to reserve a permit, print a fishing license or do anything online. Now that it is fast it seems more people want to use it and abuse it and that’s what I’m not happy about. I don’t like to see people on their phones or iPads when they should be outside experiencing the great outdoors at the end of the Gunflint Trail. I understand there are a couple of instances where it may be necessary to check in with someone or check on something but I don’t want people wasting their precious vacation time on their gadget. I also don’t want other people who are taking a gadget free vacation to have to be exposed to someone else using gadgets. It just looks and feels bad. I hope you understand my need to have a rule in place at Voyageur. There are some things I’m not ready for and one of those is people sitting on our picnic table outside of the store talking on their cell phone. 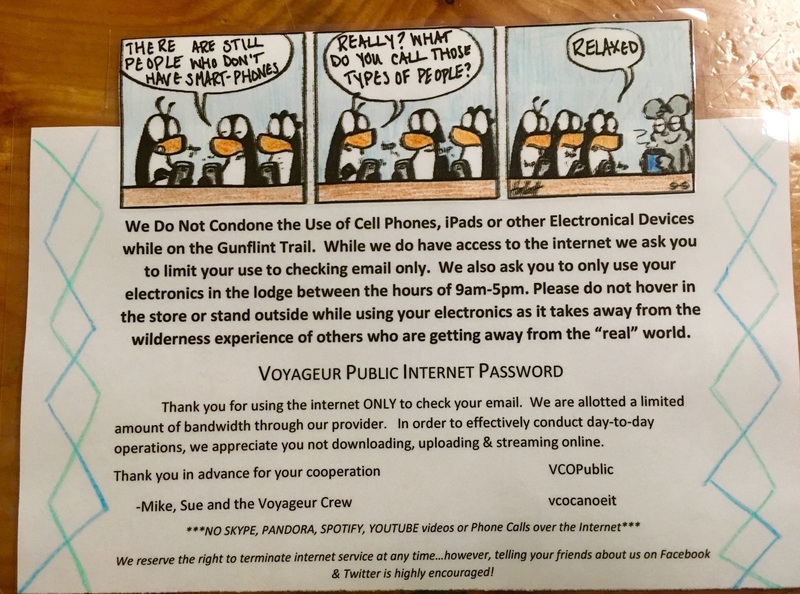 I don’t ever want to have that be OK.
Go Gadget Free on the Gunflint Trail!